Before we dig further into the subject of this post, I'd like us to take a step back and reacquaint ourselves with the importance of ratings for our websites and, by extension, our businesses. Online ratings are becoming increasingly important for the e-commerce for various reasons. The first and foremost in my opinion is the fact that they are essential to our Local SEO. Ratings are a strong indicator for search engines which indicates that the website holds trustworthy content. Hence, the website is a likely candidate to appear higher in the search results and skyrocket its CTR (Click-Through Rate)! Second, they are a strong, if not the strongest already, deciding factor for the consumer to click your search result and affect his decision to purchase immediately afterward. In terms of SEO-Talk this means its CR (Conversion Rate) will undoubtedly climb! Joy all around! First of all, Joomla already supports a basic implementation of Microdata (one of the ways to communicate with Google). The problem is that this implementation is still in its infantile stage and by now I could argue that it is not as effective as it might have been at the time it was implemented. To top if off, the default Joomla! Microdata has no support for Star Ratings out of the box. 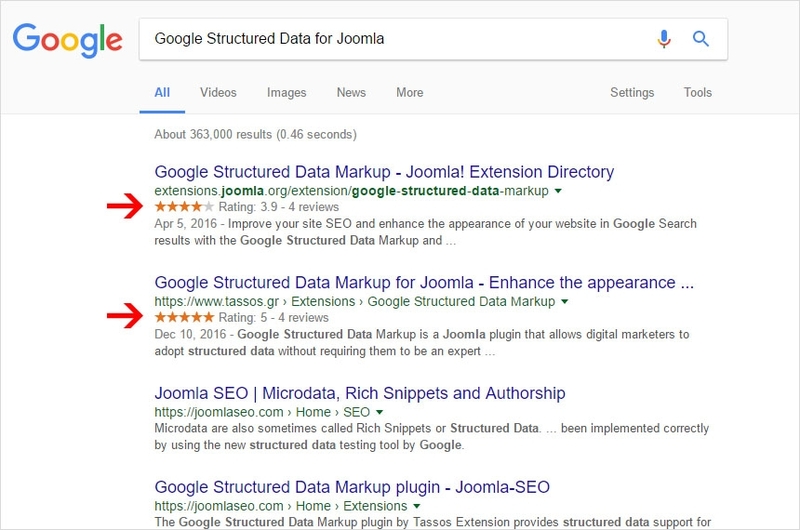 Google Structured Data Markup v2+ to the rescue! To fill this gap, and many others, the latest version of Google Structured Data supports Star Ratings for both your Articles and your Products alike! If you do not have a star rating system in place to automatically generate the rich snippet already, then you can just go to your Article or to your Product post and manually add both the Rating and the Review Count alike! Let's see how you can get your Star Ratings setup with Google Structured Data from Start to Finish! 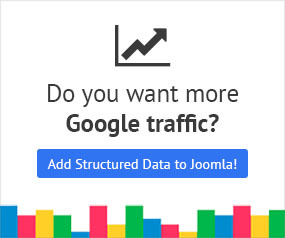 Purchase and download the PRO version of Google Structured Data. Go to your Joomla! Administrator panel and click on Extensions > Manage > Install. Right after that just use the Upload Package File and click the Upload & Install button below. Most probably the plugin is already activated but just to make sure, navigate to Extensions > Plugins and search for it in the list with a keyword like "google". If, when you find it, the result is just like the one in the screenshot below then you are good to go! Elseway, just click on its activate icon to proceed with its activation. Your Joomla! Article editor now has a new tab, the one in the screenshot below, called Google Structured Data. In this tab define whether you are editing an article, a product or even an event. Since in this tutorial we are talking specifically about Articles, go ahead and click on the Article option. Once you select the Article option, a new window opens where you will be able to see the Structured Data related to the Article Data Type. As you can see in the screenshot below, there is a Star Rating available in the Rating Value schema property where you can define a custom rating of your article! Of course you must be accurate & truthful and use a rating value that's is displayed to the visitor as well. Finally, click Save and you are done! This final step is essential in order for you to be sure that what you have setup until now is correct. Go to Google's Structured Data Testing Tool and on the modal that will appear, fill in the url of your article. If the tool detects 0 errors and 0 warnings your article is ready!